Curated by the MCA’s Steven Bridges, the group exhibition Cosmosis, on view through August at the Hyde Park Art Center, is a new and thoughtful chapter in the recent of explorations into the inherent relationships between science and art. Bridge’s show is the final entry in the Contemporary Art Council’s annual commissioning of an exhibition that highlight developments in Chicago’s contemporary art landscape through emerging artists and curators. Cosmosis encapsulates the particular character of Chicago artists’ innovative practices by tapping into the robust networks that connect local artists and the level of engagement with broader discourses. The exhibition is part history lesson and part musing on the limits (or lack thereof) of the cosmos. Images like Jefferson Pinder’s star field map, Stellar Plane (2014) or Erica Bohm’s series of appropriated space polaroids speak to a desire for an expanded view of how we interact with the invisible world, in its minutiae and vastness. 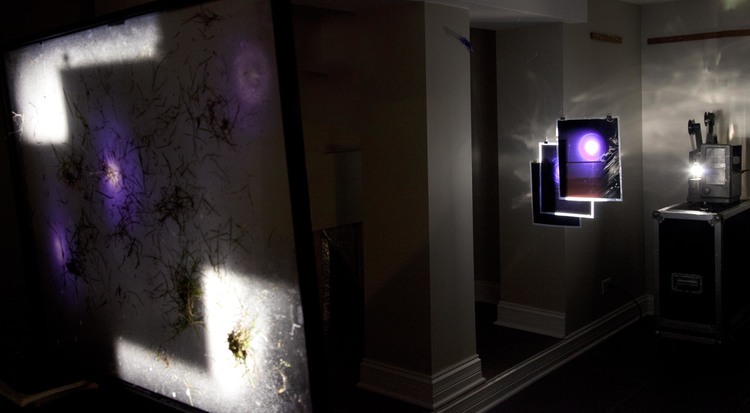 Jeremy Bolen’s installation, a record of his work with the Advanced Photon Source at the Argon National Laboratory, creates a conversation, continually looping through an antique projector, between the environment of the gallery, remnants of invisible light, captured through photography, and the physical world. The implicit relationship between the audience and both the tactile and elusive spectrums of our environment, grapple directly with the perceptive and prescriptive modalities being upended throughout the show. Bridges claims to be conflating the shared methodologies between scientific inquiry, childlike wonder, and the human condition as they pertain to creative practice and cosmology. What is clear is that these fascinations are not the curator’s alone—these questions are fundamental to the modern human condition, and these are artists, and others, are experimenting in ways increasingly in tune with their scientific counterparts.